More Space, More Functions and More Benefits!!! •Are you having problems with finding an all-in-one Ipad holder and Car seat organizer? •Do you want one that is easy to use and offers much more value for your money? Then get the AutoMuko Ipad holder and Car seat organizer NOW! This AutoMuko Ipad holder and car seat organizer offers a unique solution to using your Ipad without holding it or placing it on your car seat. It also provides another convenient solution, which allows you to store, organize and coordinate your personal effects and other items, so as to avoid litter or clutter on your car seat. It features 2 mesh bottle holds and 3 mesh small bags that are evenly distributed on either side of the overall design. Each mesh pocket can be used to hold a variety of things according to their size and height. The bottle holders can be used to hold different sizes of bottles while the small mesh bags can be used to hold an unlimited number of things (if the size fits). For example, they can be used to hold smartphone, pen, small journals, money, keys, rings, wallet, cords, crayons, earbuds and lots more. The included adjustable straps and quick release buckles make it very easy to set up and install this bag. Simply strap it around the head rest of the front car seat and fasten it with the buckles. After setting it up, you can easily place your Ipad inside the large mesh holder and start operating it as you wish. The bag has a universal installation system and design which makes it very compatible with most front car seats. It is a must have for every car owner, including you! Get the AutoMuko iPad orgenizer today for yourself and for your family! WIDER AND ROOMY: AutoMuko Ipad holder and Car seat organizer has an efficient size specification/measurement, which gives it more room from its wide surface area. With this extra space, you can store more items without worries. 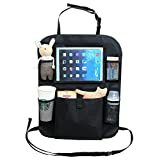 MORE POCKETS: Aside from the protective Ipad pocket, this product also has a couple of other fully functional pockets, such as the 2 small bottle holder mesh pockets and the 3 small mesh bags for organizing your personal effects or items. UNIVERSAL COMPATIBILITY: This AutoMuko Ipad holder and Car seat organizer is compatible with all types of front car seat. It fits most seat backs and can be conveniently set up the same way, without stress or difficulties. EASY TO INSTALL: The bag features adjustable straps and buckles, which can be used to set it up easily and conveniently. The straps and buckles are extremely adjustable, so you can install or set the bag up according to your preference.